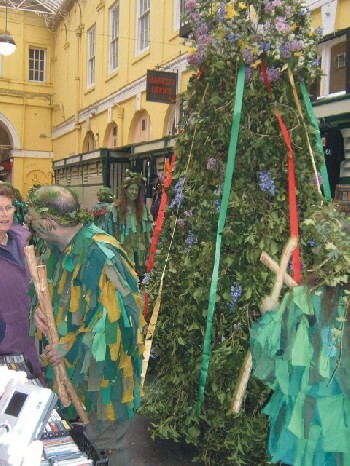 Some years ago I discovered the Hastings Jack in the Green and was delighted to find a May Day festival to rival my all-time favourite, Padstow. Well, obviously someone else was equally excited by Hastings, because they decided to do the same thing in Bristol. That gets my vote  its a long way to Hastings. 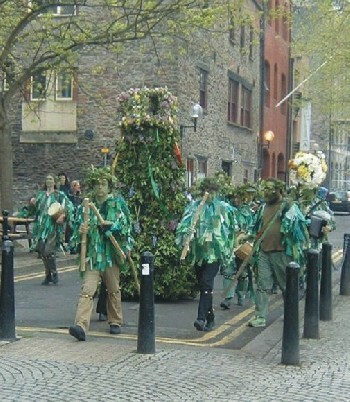 The Jack in the Green is a procession of Jack  a kind of ten foot walking cone of vegetation topped with a flowery crown  together with musicians, singers, drummers and dancers, all in green; green ragged jackets, green garlands and green faces. 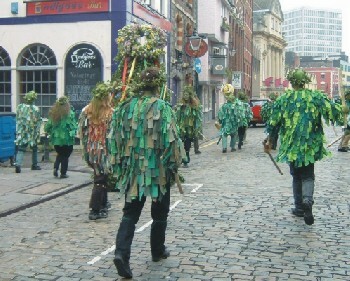 The leader of the procession carries a staff or wand festooned with flowers and greenery and directs the company, who play, sing and dance all the time (apart from suitable refreshment stops), along the route. This May, the showers of spring gave way to the rain of summer! In fact, I suspect that the successive providers of Jacks motive power were better off than they would have been on a sunny day  its a long and arduous journey from the Industrial Museum at the waterfront, all the way through Bristol to Horfield Common. 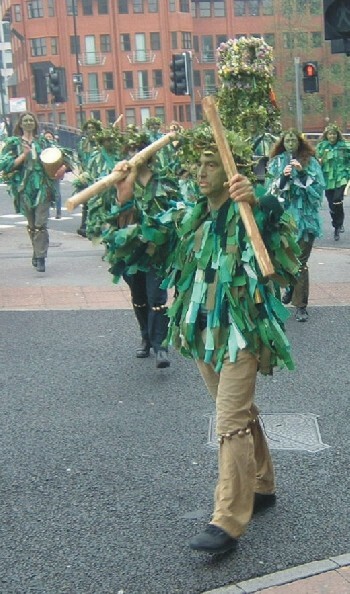 The procession starts at 10.30 but the participants are there much earlier, making final preparations,(including learning the dance in one case  vital to avoid over-rehearsal after all). The journey ends six hours later with the death of Jack. This Jack in the Green doesnt yet have the following of Hastings, but Im sure everyone reading this will make sure it does next year. 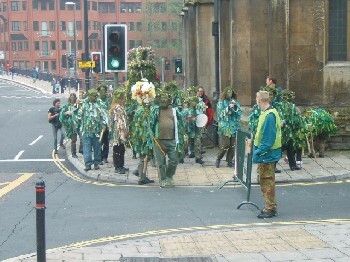 Its a heartening and stirring sight to see green people singing and dancing through the City streets, forming a surreal counterpoint to those other green men on the pedestrian crossings. Anyone who gets too near gets a bit of Jacks magic applied to their faces. 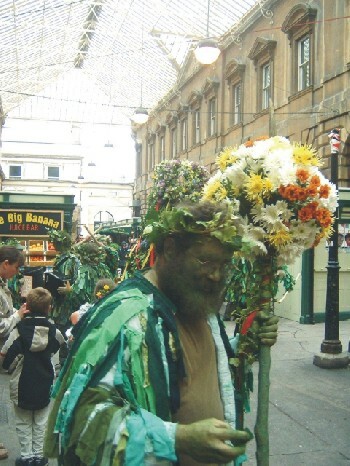 Many people stop and smile, enjoying the spectacle; others are bewildered by the sudden arrival of green men in their shop doorways shouting that the summer has come. Coming into the enclosed alleyway of St. Nicholas Market, with its smells of olives and coffee, the drumming reverberates back off the walls, and the space fills with Jack and his followers, who halt here for the first of the much-needed refreshment stops. 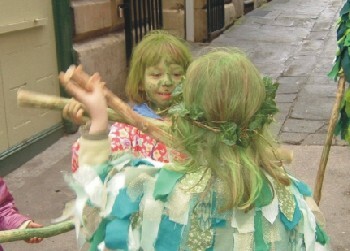 Glasses of beer appear miraculously and while the adults rest, the children copy the dance, with the choreographed blows of stick upon stick, their pretty faces green-painted and flower-crowned. 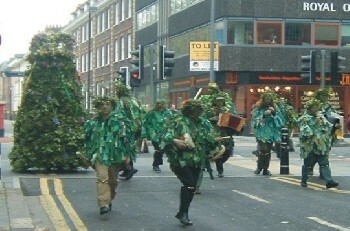 The Jack is a heavy wicker structure, woven through with a thick covering of greenery and flowers. Once inside, little can be seen and a guide has to walk in front, backwards, warning of hazards and obstructions. Its easy to overlook that you have to consider overhead obstructions as well, with a structure over ten feet tall when lifted and moving. 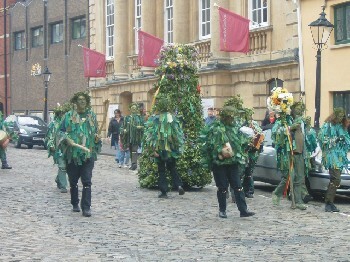 People take it in turns to be Jack, bringing him to life with dancing steps, turns and unexpected sallies to investigate passers-by. 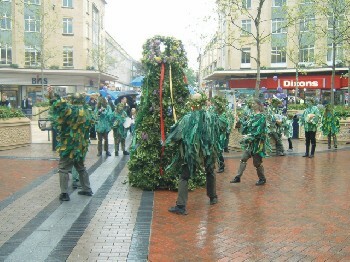 From St. Nicholas Market the procession goes to Broadmead and stops there to perform a dance around the Jack  on this occasion in determined rain. We stayed to cheer and applaud and then slipped away to do more mundane things before catching up with them at the end of the route. What we hadnt realised was that Horfield Common is spread over a number of locations and after spending an hour sitting on one part of the common listening to the football match, we realised that either the football was a more attractive prospect to many than seeing Jack in the Green, or we were in the wrong place. 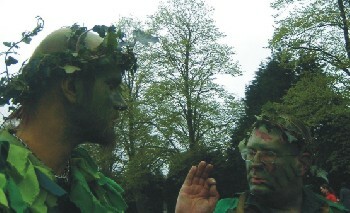 A rapid scan of the several other patches of green also known as Horfield Common struck gold, and we arrived on the common as Jack did. There was a fair crowd waiting and Jack hastened up the hill, a little too enthusiastically, and had to be re-erected rapidly. 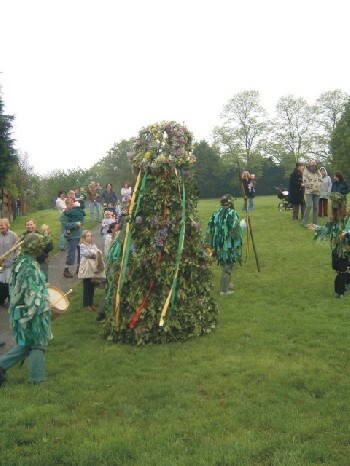 Its odd how surprising it is to see that there is someone inside  the Jack in the Green really does take on a life of its own. 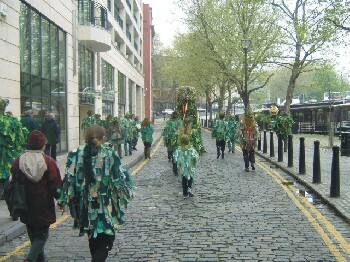 The dance is performed once more, with the dancers seeming as enthusiastic as ever, despite how exhausted they must be after their six hour journey. 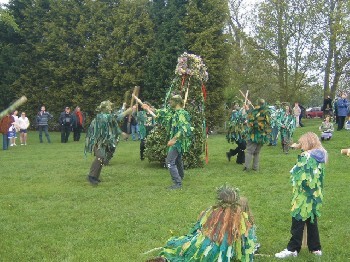 The story of Jack is told in poetry, then (the occupant having covertly escaped) the Jack is killed with a spear, releasing the power of the summer. 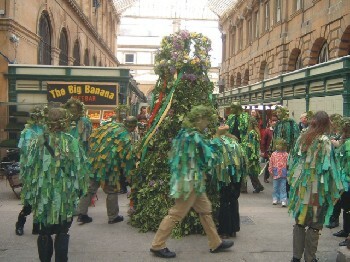 Everyone rushes around the structure, pulling off greenery to take home and bring the summer blessing of fruitfulness to their homes and their gardens. 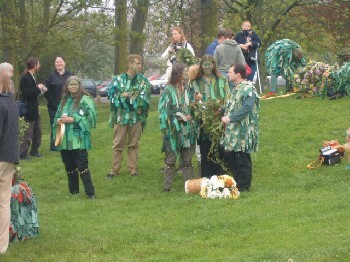 This was a wonderful day, the dull weather doing nothing to spoil the occasion. 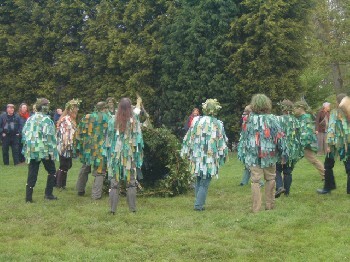 Everyone worked so hard, looked so good in their greenery, and made such a great spectacle. The only thing that would make it better, would be more people going along and supporting them! 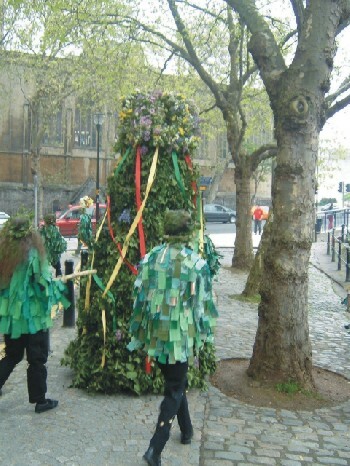 Have a very special May Day next year and see the Bristol Jack in the Green. 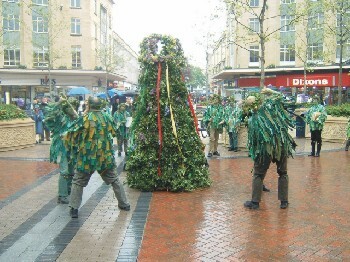 To find out more about Bristol's Jack in the Green visit the official website.